It has not been a bad winter for gales, thankfully, and those that have run through have been quite late. On the 20th March 2017, we recorded gusts of almost 60 mph on our little weather station which we know under-reads. A day or two later, Helen took advantage of the calmer conditions for a quick dogwalk into the hills near our house in Clachtoll. Something out-of-place caught her eye, so she went to investigate. 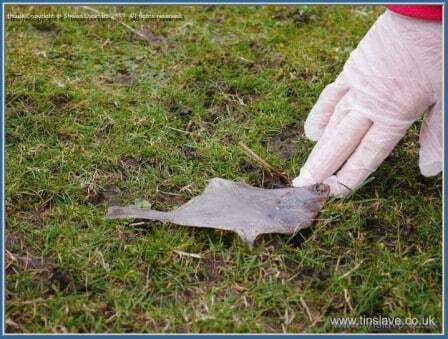 It was a flatfish, about 15cm in length. Now this was a good mile from the sea, as the fish flies, visible in the background in the first picture on the right, and there were no apparent tooth or claw marks on the fish. 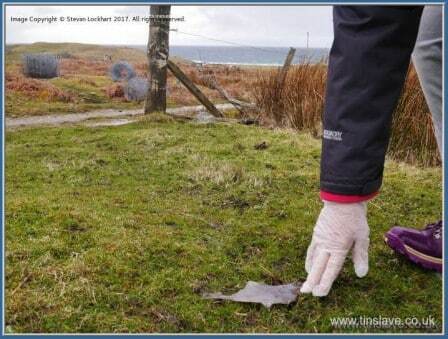 I posted the pictures we took on Twitter, and our countryside ranger, Andy Summers, asked us to lift the fish for identification, hence the plastic gloves in the pictures. It seemed to me reminiscent of stories of it raining fish. Dr. Eddy Graham, the meteorologist at the University of the Highlands and Islands, replied to my tweet suggesting that it was quite possible that, given the string gusts of the previous day, a waterspout, in effect a mini-tornado, may have lifted the fish from the Minch or more likely the shore, and deposited it on running out of energy inland. The 60mph gusts recorded in our rather protected location would have been much worse out at sea. Eddy contacted the UK tornado service who seemed interested in this possibility. I have never seen a waterspout, but an early childhood memory of a family story is of my grandmother telling me of seeing a waterspout at sea. Granny was a Londoner, and in 1916, from what I can make out, the Zeppelin bombing raids on London affected the family. So at the age of 6, her mother took her on a sea voyage, which in 1916 must have been dangerous, away from Britain to the safety of Cape Town, and it was on that journey that Granny described seeing the waterspout. As she remembered it after so many years, it must have been a frightening experience for a small girl.